Flip-top tables from Correll, Inc. are great for a classroom or cafeteria setting. 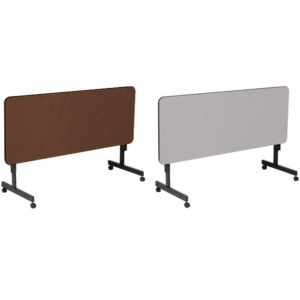 FT2472M feature a solid, melamine table top measuring 72 inches long x 24 inches wide. The table top height is adjustable up and down using set screws. When folded into the storage position, the table top measures only 3.5 inches wide. Multiple tables can then be easily stored by rolling them into position, one next to the other. Best of all, these tables are made in the U.S.A. in Arkansas. Dimensions: 72 inches L x 24 inches W.
Table top height unfolded: adjustable from 23 inches to 31 inches in 1 inch increments. Material of construction: melamine. Melamine is a high density particle board. Color: available in gray granite or walnut color options. Table top thickness: 3/4 inch. When table top is in folded position, the top and support frame are a total of 3 1/2 inches wide. Table is transportable using 2 swivel casters and 2 lock casters. Table top height is adjustable using set screws. Height is tamper resistant using a small wrench (included with shipment). Comes with a 1-year factory warranty from Correll, Inc.
Table weight: about 73 lbs. Shipping dimension: 73 inches L x 28 inches W x 6 inches H.
Shipping weight: about 79 lbs. Rigid H-Frame table support makes the table ideal for commercial use. Q: Is the table assembled, how long does it take to be delivered and will it be delivered to my office? A: Yes, the product is completely assembled and it takes about 7 to 10 days to receive. Feel free to contact us with any other questions. 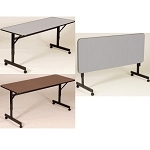 Get Shipping on In Stock Items when ordering these tables in quantities of 12 or less. Orders will generally leave the warehouse within 3 business days from Correll, Inc. in Arkansas. Shipments for this table is via an ltl freight carrier, which will deliver via a curbside delivery. Curbside deliveries require the customer to be present to sign for the package and to move the product wherever needed at the delivery property. If needed, delivery appointments can be scheduled through the freight company once you receive your tracking number via email. Dimensions: 73" x 28" x 6"